“As the heart panteth after the water brooks, so panteth my soul after thee, O God.” This thirst for an intimate relationship with God, claims A.W. Tozer, is not for a select few, but should be the experience of every follower of Christ. But, he asserts, it is all too rare when believers have become conditioned by tradition to accept standards of mediocrity, and the church struggles with formality and worldliness. 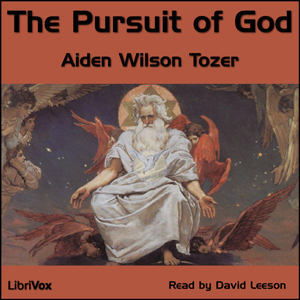 Using examples from Scripture and from the lives of saints who lived with this thirst for God, Tozer sheds light on the path to a closer walk with God. Acoustical liberation of books in the public domain. LibriVox recordings are Public Domain in the USA. If you are not in the USA, please verify the copyright status of these works in your own country before downloading, otherwise you may be violating copyright laws. Tradition, Scripture and the Church - Part 1: "Tradition and Scripture"